I used to make a small garden when I was a child. I loved watching the little plants grow, tending them and having wonderful vegetables to eat when they were ripe – even though we shared a lot of the harvest with the local bunny population. I started gardening again as an adult when my kids were little. 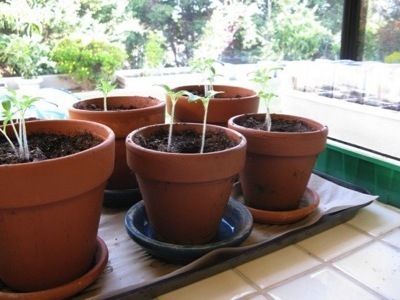 At first I’d buy a few starter plants, maybe tomatoes and cucumbers and put them in a small garden area. The results varied but it was still a fun project for us to do together. As the years have gone on, I’ve gotten more serious about my gardening and try to learn and grow something new each year. My gardens have always been organic but I’ve learned more as I’ve got along about natural fertilizers, making compost and foliar feeding. I’ve usually grown a few plants from seed; sometimes herbs or various other plants, but I decided a few years ago that I wanted to try growing everything I plant in my garden from seed.